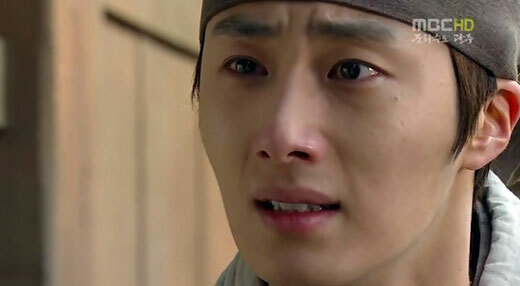 Jung Il Woo Appears in The Sun and the Moon with Dyed Hair – Foreign Envoy? A goof is found in The Moon that Embraces the Sun, not only unintentionally made viewers laugh his teeth off, but also hindering the immersion of viewers into the plot. In the episode 8 of MBC Wednesday and Thursday hit drama series The Moon that Embraces the Sun broadcast on January 26th, 2012, Wol (Han Ga In) encounters Prince Yang Myung (Jung Il Woo) who is disguised as a monk while trying to escape, and she asks for help from the monk. In the day’s plot, Wol who was kidnapped successfully escapes, and ran into Prince Yang Myung who disguise oneself as a monk in order to avoid from noble. In the scene, Prince Yang Myung is wearing a hat, with a hair band, but reveals sideburns that are dyed into brown color. Seeing the dyed hair in the historical drama that is telling the story during Joseon Dynasty era, will have some impact on immersion of the audience into the plot. After the broadcast, viewers said, “Is Jung Il Woo acting the role of foreign envoy?” “TV series has frequent goofs, it should not as simple as just mistakes,” “When watchig TV yesterday, my mind was all about goofs,” and so on, the comments were quite harsh. On the other hand, The Moon that Embraces the the Sun increased 2% in ratings from previous episode to make the 31.7% ratings record.